Myron H. Dembo was the Stephen Crocker Professor of Education in the Rossier School of Education at the University of Southern California. He is a fellow in the American Psychological Association, associate editor of the Elementary School Journal and on the advisory board for the Journal of College Reading and Learning. He also has served on the Board of Examiners of the Educational Testing Service to write the Advanced Education Test of the Graduate Record Examinations. 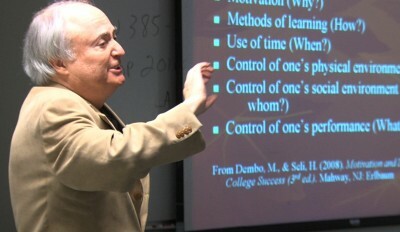 Professor Dembo specializes in the areas of learning and motivation, with special focus on teaching students how to become more self-regulated learners. He has written three books and over 75 research articles on the teaching- learning process. His educational psychology textbook, Applying Educational Psychology, is now in its 5th edition. His most recent book is: Motivation and Learning Strategies for College Success: A Self-Management Approach (2nd. ed.) This text is designed to help students become more self-regulated learners.